After 13 seasons, five Premier League titles, three League Cups, an FA Cup, UEFA Champions League, Europa League and FIFA Club World Cup winners medals, Wayne Rooney is leaving Manchester United to return to his boyhood club of Everton. Rooney’s time at United was tumultuous. Twice, he asked to leave the club, but during his time at Old Trafford he became the leading scorer for both Manchester United and England. In fact, the only reason he didn’t score more than he did was due to his own versatility and selflessness, as he often moved around the pitch to accommodate players like Cristiano Ronaldo and Robin van Persie. Rooney wraps up his Manchester United career with 253 goals, and while these days the player is a shell of his former self, he did score some truly terrific goals in his time at Old Trafford. What made Rooney the player he was wasn’t that he could just score goals. Rooney could do it all, and was one of the best passers not named Paul Scholes to ever play for United. Aside from the 253 goals Rooney scored in a United shirt, he also assisted on 145 more. Here are two of the best. When Carlos Tevez signed for Manchester United at the start of the 2007 season, it took a while for his partnership with Wayne Rooney to develop. So much so that people started asking if the two were too similar and therefore would never be able to fully play together. Then Middlesbrough came to town. The two combined on this fantastic goal and no one ever asked that silly question again as United rolled to a second straight Premier League title and won the Champions League. While Louis van Gaal got all the headlines for moving Rooney to CM, Sir Alex Ferguson actually did it back in 2012. Whether or not Rooney was happy about it was one thing, but there was no question he unleashed some great passes to spring the attack. None were better then this bomb to Robin van Persie, the second of three Van Persie goals the night United clinched the title. Now, let’s get on to the best goals Rooney scored with United. When you arrive at Old Trafford at 18 years old with a hefty price tag, you’re also going to get some hefty expectations. Wayne Rooney had them all and could not have gotten off to a better start when he scored three times on his United debut. Boy, could young Wayne Rooney do everything. He had the pace to spread defenses out, the moves to take on defenders one-on-one, and a shot that made you pay if you gave him even a yard of space. Young Wayne Rooney wasn’t afraid of anything whether it was a defender or the wrath of Sir Alex Ferguson. 30 yards out, goalkeeper’s off his line? Why not try a chip? Brilliant. After not making it out of the group stage the previous year, Manchester United made a run to the semifinals of the 2006-07 Champions League. United were down late, thanks to an unbelievable individual performance from Kaka until Cristiano Ronaldo equalized. In injury time, United got a chance to launch their infamous counter-attack. Ryan Giggs played a fantastic ball in and Rooney was there to steal a game United had no business winning. Having been embarrassed by Barcelona in the Champions League final two years earlier, United were looking to make things right this time around. 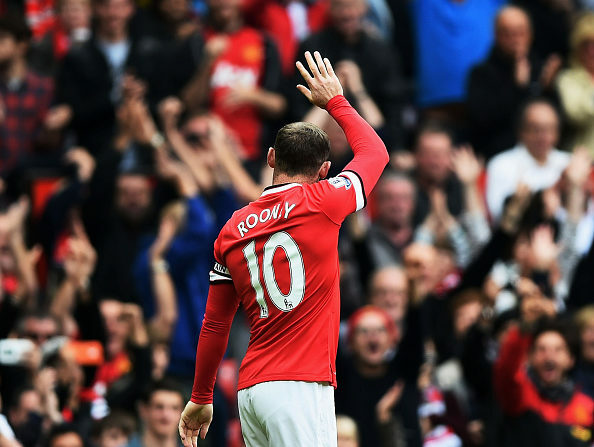 Once again, they fell down 1-0 early but this time Rooney was around to score a sensational equalizer. Unfortunately for Rooney, that was the high point of the match as Barcelona once again ran United off the field. David James was barely even off his line here, but that didn’t stop a young Wayne Rooney from trying, and pulling off, a fantastic chip. We already know Rooney can’t resist a good chip, even if he’s barely over the halfway line. The only reason this isn’t higher is because Beckham did it first. Even if Rooney had just scored a tap in for his 250th goal it would have made this list albeit a bit lower. But this was something else. Rooney struggled all season long but turned back the clock on this free kick, deep into injury time, to equalize for United and keep their unbeaten run alive. It wasn’t just the strike here, which was sensational in and of itself, but the story behind it. Rooney was about to be subbed off and felt he had just gotten fouled. Mad at the ref, Rooney stayed down on the pitch for an extended amount of time. When he finally got up, an angry Rooney decided to take out his frustrations on the next thing he came in contact with. Luckily for United it was the ball. Obviously this goal is number one. If I was ranking the best Premier League goals ever, I’d put Aguero’s winner against QPR in 2012 at No. 2 and this one at No. 1. While it was sensational in its own right, the context of the goal puts it over the top. Manchester City were becoming the noisy neighbors and building their stat-studded squad. In the 2010-11 season, a tumultuous one for Rooney, they thought they were finally there. With the score 1-1 and City asking all the questions, Wayne Rooney reminded them who still owned Manchester, at least for one more year, in the most sensational of ways.